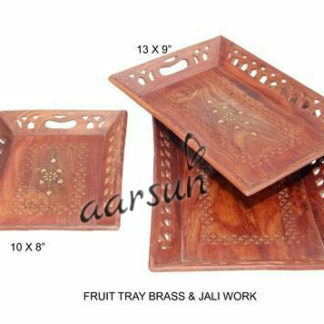 Fruit Serving Tray Set (3 pieces) made from Seasoned Sheesham Wood (Indian Rosewood) with Floral Design &amp; Jaali Work hand crafted by skilled artisans. Sheesham wood is the most popular Indian wood across the globe known for its durability, natural rich grains, and longevity. Sheesham wood has a beautiful irregular grain structure which is very distinctive in appearance and can be polished to a fine finish.